Do You Make These Common Costly Mistakes When Buying or Building Your Solar Panels and Solar Power System? 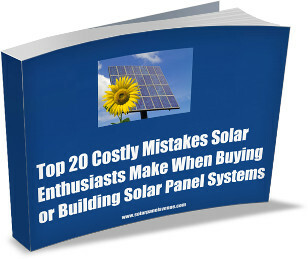 "New eBook Written By Experts Exposes 20 Costly Mistakes Solar Vendors, Solar Retailers or Installers Don't Want You to Know "
…and much more easy to follow practical and money saving information about solar panels and solar power systems written by experts for those who can’t get started . No credit card required. You can unsubscribe at any time.